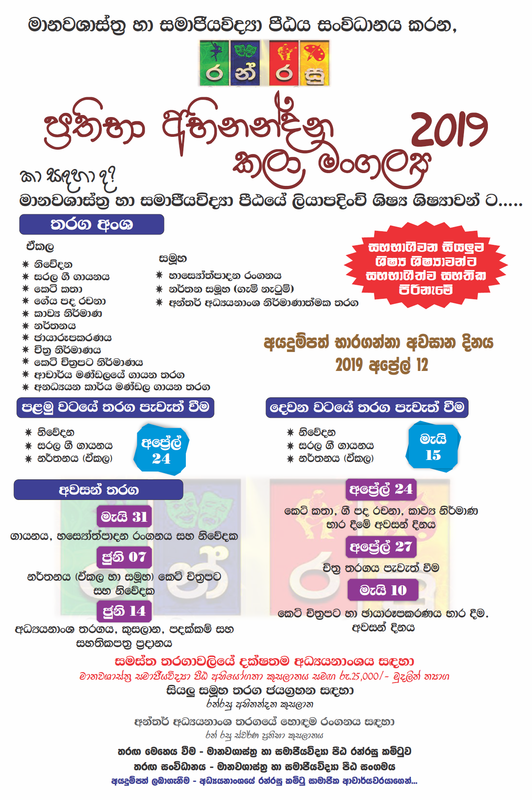 ‘Ranrasu 2019’ Festival of Art organized by the Faculty of Humanities and Social Sciences will be held on 31th of May 2019, 7th and 14th June 2019 at the Bandaranayaka Hall of the University. Concurrently to the Ranrasu 2019, ‘Ranrasu Academic Volume’ will be launched. This is the largest festival of art conducts by the Faculty of Humanities and Social Sciences, aiming to open a platform to display undergraduates talents in various fields such as dancing, singing, announcing, playing, acting, painting, lyrics writing, short story writing, short film making, documentary writing and producing, etc. Undergraduates in the faculty, academic members as well as non-academic staff members have the opportunity to participate in these competitions and to show their talents and skills and finally to own the victory.